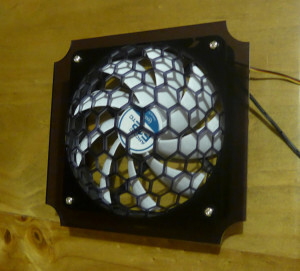 Cheap and easy temperature controlled cabinet fan. 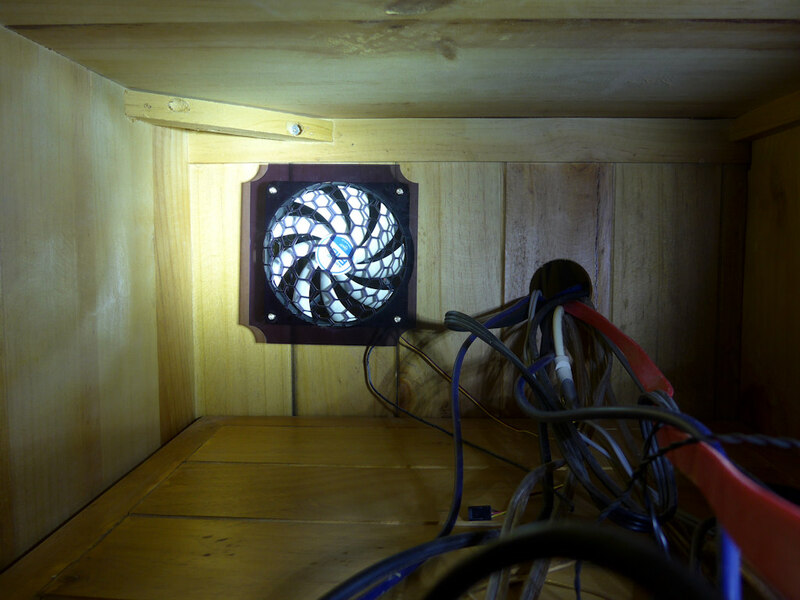 This cabinet cooling hack is based around the Artic F12 TC series fans because this fan has a built in temperature sensor. It’s not a hardware hack at all. 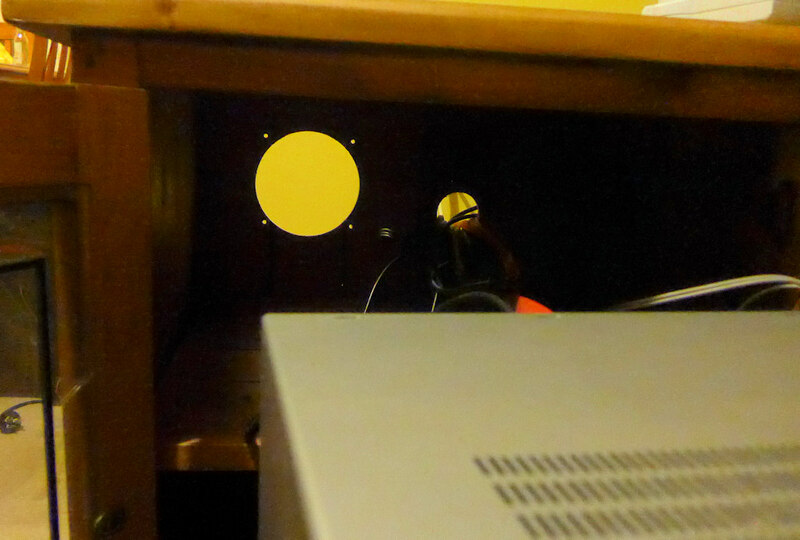 but a ‘cabinet hack’; so don’t be afraid to give it a go if your not into electronics. 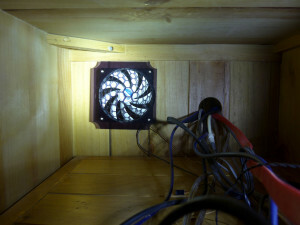 less irritating and deeper than normal fans (sounds like a fridge) when going full ball. The specs say it can run on 5v so USB power may be an option. Edit: I just tried one out on my bench-top power supply. It did not move until about 6.5v. For this project I am using my DIY honey-comb fan guard (details here) to protect the fan and install it into a cabinet. Step 1: Plan it out. Figure out which way you are going to position the fan. 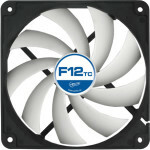 Route 12v power to the fan pins and check it spins and works before installing. Don’t worry about an off switch, it will idle silent when your devices don’t need cooling. You can use a 12v wall wart. By my testing, this neat little fan in question draws 30mA on idle and about 100mA when going full throttle. So look for a 12v wall-wart in the 150mA to 200mA range. Also Red is positive, black is negative, and don’t do anything with the yellow. Step 2: Cut your cabinet. Use a 120mm hole saw and a stencil (I have one here). Unplug everything in your cabinet, don’t dill through into your favourite electronic toy. Do the hole-saw first, then the other four holes. Then, if your hole saw moves of target, you can reposition your stencil. Stencil (on right, print at 300 dpi. The big circle should be 120mm in diameter and the screw holes 105mm centre to centre. Step 3: Assemble and Enjoy. 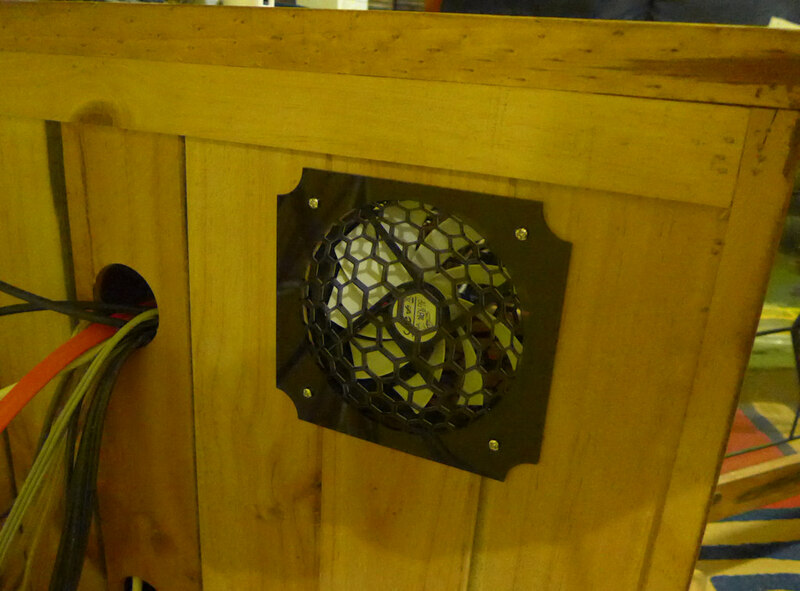 You may need a guard on both sides, to prevent errant wires entering the fan. Generally tuck the sensor out of harms reach. Place your temperature sensor on the device if you need more aggressive cooling.